The old Norman Church, which stood on the north side of the main street, opposite Bakery Cottage, described in 1791 as "very ancient, the smallest I ever saw" by John O'Keefe, had originally one aisle, a low square tower, under which was the gallery, reached from the churchyard by an outside flight of stone steps and a small porch on the south side. In 1842 an extension was made, bringing the outside wall level with the porch and thus giving the Church a curiously lop-sided appearance. In the gallery sat the choir with its flutes, violins, 'cello and double bass. Much of the music was written by local musicians, and many in the village remember hearing of the parts played by their grandparents. 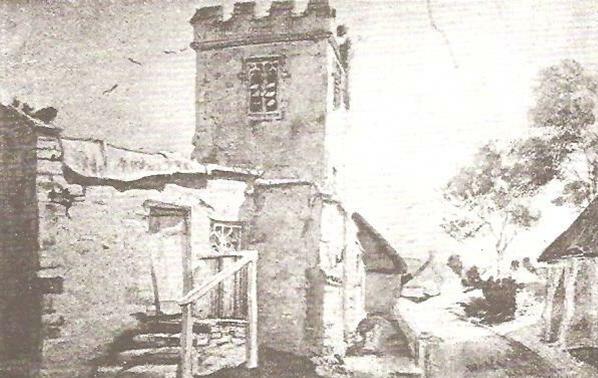 By 1869 the old Church had become dilapidated and inadequate for the needs of the inhabitants of West Lulworth. It was very close to cottages on either side, and the Rev. William Gildea, curate of Winfrith and later a Canon (non resident) of Salisbury Cathedral, whose living it was, of an annual value of about £130, arranged for the building of the new Church and Vicarage on a far more convenient site. The foundation stone was laid by Lady Selina Bond, wife of Nathaniel Bond. Esq., of Holme Priory, the fifth daughter of the Second Earl of Eldon. "The stone itself was found buried a foot or two underground in the old churchyard. It now supports four arches, and underneath it was placed a glass bottle containing a newspaper and one or two coins of the year". The brass plate can be seen behind the base of the lectern, and the inscription reads "This stone was laid by Lady Selina Bond, June 1st 1869, William Gildea, Vicar, William Randall, Thomas Randall, Jun.. Churchwardens". The Church was consecrated by the Bishop of Salisbury, Dr. George Moberley, on 11th May, 1870, "In a fierce gale of wind accompanied by heavy rain", in the presence of twenty-five other clergy, the churchwardens and many parishioners and friends. In his memorandum of November, 1879, the Rev. W. Gildea states: "The Communion Table is made of oak cut out of the beams of the old Church roof, which were much decayed except in the centre". "Some of the wood in the reredos was wreck picked up at sea and still has trace of the paint of the vessel to which it belonged. The three panels of the reredos were painted by Miss Hicks, daughter of the architect." The carved panels on either side of the oak reredos, come from Oberammergau. They are carved in deep relief in lime wood, and are the work of Hans Mayer, the son of Josef Mayer, who on three occasions, in the years 1870, 1880 and 1890, acted "Christus" in the Passion Play. It was after a lecture on the Passion Play given in Lulworth in 1894, by Mr. Arthur Evans, that the villagers heard of the beautiful wood carving at Oberammergau and decided to start a fund to purchase some for the Church. The panels represent the Birth and Baptism of Jesus, the Crucifixion and the Supper at Emmaus. They were placed there in 1895. The lectern stem and base contain woods from Europe, Asia, Africa and America. The eagle standing on its globe was executed by Messrs. Case, Strand, London. The Rev. William Gildea was a keen amateur woodworker. Helped by Mr. Basil Sprague, who turned the wood pillars, capitals and bases, and by Mr. John Chaffey, he executed the altar, reredos woodwork, altar rails and the stem of the lectern. The beautiful carving of the columns and corbels was done by Mr. Benjamin Grassby of Dorchester and was the gift of Mrs. Gildea. The capitals are of French Early Gothic foliage variety. The illuminated texts over the arches of the Nave were painted by Mr. Thomas Randall of Hamboro’ Farm, who died a few weeks before completion of the work. Members of the Randall family were churchwardens for over 100 years. Mr. Matthew Randall had been chiefly instrumental in adding an aisle to the old Church, and took a great interest in the building of the new one. Mr. William Randall acted as churchwarden throughout the seventeen years of the Rev. W. Gildea's incumbency. For several years before his death in 1981, Mr. P. J. Franklin , F.C.LO.B., gave generously of his time and expert knowledge; arranged for the complete redecoration of the church; and for the illuminated texts to be repainted by Mr. F. E. J. Chinchen of Lulworth Camp. 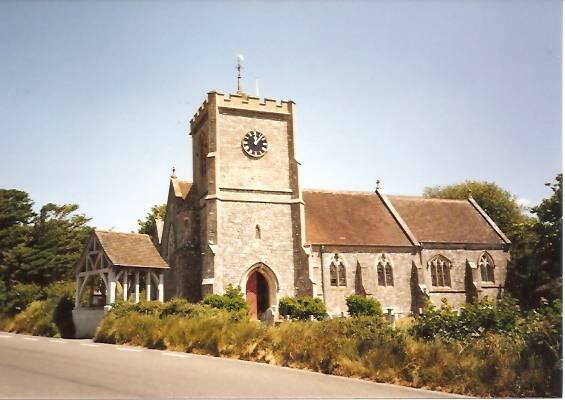 The first couple to be married in the new church, on 16th February, 1871, were James George Dorey, aged 23, and Maria Eliza Saunders, aged 24, grandparents of Mr. Walter Dorey, who is the last of the West Lulworth Doreys, a family whose names appear in the earliest registers from 1745. Unfortunately the older registers dating back to the sixteenth century were destroyed by fire. The earliest mention of a curate is Sir Peter Rosse, 1553. Later names are: S. Haines, 1753; Benjamin Thomton, 1777; John Bale, 1789; Robert Goodrich, 1803; Franklin Tonkin, 1845; J. G. Fisher, 1847; Edward Dix Wood, 1850; Cornell P. West, 1852; Joseph Maskell, 1855; John Wynne, 1857; W. A. Bayley, 1861. The continued list of Vicars is behind the Font. The first, the Rev. William Gildea, was obviously a man of great character and many talents. His wife, five sons. and four daughters, together with his large staff at the Vicarage, centred village life around the Church. There is no doubt that he largely financed the building himself, with the aid of loans from Lord Eldon, the Rev. Eldon Bankes, and Nathaniel Bond, Esq. The Rev. W. Percy Schuster and his family also had an outstanding influence, and provided the Church with most of its stained-glass windows and many essential adornments. The Parish Church is now included in the list of buildings of special architectural or historic interest. Tenor - "Through all the changing scenes of life"
May Jesus Christ be praised"
Without the enthusiasm of Lady Fripp, and much help from Captain Schreiber (see later), the tower might never have been rebuilt. Lady Fripp organized a large fête and raised money in many other ways. She also made many gifts to the Church. Sir Alfred and Lady Fripp came to the Mill House in 1911; later Weston was built for them (designed by Lutyens). His father and uncle, Alfred and George Fripp were both well-known artists and painted beautiful water-colours of the old cottages, the Mill pond, the Cove and the rocks of the spring, before the waterworks took away its charm. Sir Alfred, (surgeon to King Edward VII), and Lady Fripp were most popular in the village, and gladly attended to the health of any local sick children. They are both buried in the Churchyard. The close connection of the family with West Lulworth, happily still continues. The Jubilee Clock, made by Messrs. Potts & Co., of Leeds, at an estimated cost of £130, was added in 1897. The clock chimes were reset by Colonel Robert Hamblin, in memory of his wife, Mary, in 1972. He left a legacy of £1,000 to the Church, to which they were both very devoted and generous. The east window was given by Messrs. R. and J. A. Williams of Bridehead, near Dorchester. The west window was given anonymously in 1898, the stained glass is by Kempe and is exceptionally good - a close composition in sombre colours. The north and south windows in the Sanctuary are in memory of the Rev. W. P. Schuster’s brother, Herbert L. Schuster, Esq. The window in the Chancel is in memory of his sister, Miss Fanny Emily Schuster, and another brother, the Rev. Edmond Vemon Schuster, Rector of Haughton Dale, Lancashire. The south window and brass plate near the pulpit recall the Rev. John Henry Lonsdale. He was a keen fisherman, a friend of Alfred Fripp since their student days, and frequently officiated in the Church. He loved Lulworth and the little sailing ships which unloaded coal for the Castle and village at the old store in the Cove. Sometimes their anchors cut adrift and caused serious damage to the fishermen's nets, which at that time were hauled in from the mouth of the Cove to under Bindon Hill by eight men. This delightful window, and also payments for divers from Weymouth to remove anchors and other offending obstacles, were given by relatives and friends of this much-loved Dorset parson. The other south window in the Nave, by A. C. Moore, is in memory of Isaac Fryer, Esq., who in gratitude for the recovery of health of his daughter in 1874, founded "The Fryer Trust" - for the distribution of coals, cash or clothing in the village at Christmas. Inflation, alas, has now made this Trust of little value. It is administered by the Parish Council. This same daughter, Mrs. Russell, when in Lulworth, lived with her crippled child at "Old Sea View" (now the Mill House). When the child died aged 14, the Rev. W. P. Schuster wrote of her as "One who in her short life, set a bright example of faith and hope and patience amid much bodily suffering". The two north windows in the Nave are in memory of Maria Theresa Schuster, wife of the Rev. W. P. Schuster, whose memorial plaque is in the Chancel; and ofChristopher John Claud Schuster, who was sadly killed in action only three months before the end of the First World War. Aged 19, he was the only son of Sir Claud Schuster, afterwards Baron of Ceme, who lived at Gatton Cottage (now Gatton House) and with his wife is buried in the Churchyard. Sir Claud was a nephew of the Rev. W. P. Schuster, and often read the lessons in the Church. The stained glass is beautiful and portrays St. George slaying the dragon, on the left side, and St. Christopher on the right. John Wordsworth, Bishop of Salisbury, son of Bishop Christopher Wordsworth 'Man of Letters'. He officiated at services whenever he was staying at his seaside home, 'Bishop's Cottage', and was a great friend to everyone in the village. His daughter. Rose Salome, was christened in August, 1900 and his granddaughter, Rosa Jane Pelly, in April, 1931, in the Church. His wife is buried in the Churchyard. The plaque is composed of alabaster and opus sectile, bearing the Diocesan and Wordsworth Arms, executed by Messrs. Powell, Whitefriars, London. William Percy Schuster, Vicar for 27 years until his death. He and his wife, mother, brothers and sister were devoted to the Church, and their generosity is recorded in many of the old Parish Magazines. He and his wife and his sister, Fanny Emily, are buried in the Churchyard. In 1925 the endowment was increased by £1,000 in his memory, by his wife, Maria Theresa. The plaque is surrounded by alabaster, carved with acorns and oak leaves. Walter Henry Chaffey. He was a faithful verger and churchwarden for 25 years and a member of the choir for 71 years. Quiet, modest and efficient, keenly interested in ecclesiastical law and anything to do with the Church, he never failed in his duty to it. He came from a long line of Lulworth Chaffeys and many of his family still live in East and West Lulworth. He is buried in the Churchyard. 1. Tenor Diam., 40^11. ; height, 38in. ; note G; weight, newt. 1. O be joyful in the Lord. 2. Gloria in excelsis Deo. 3. When sweetly chimes this bell, oer sea and hill and dell, May Jesus Christ be praised. 6. Through all the changing scenes of life In trouble and in joy. On each bell "Hears & Stainbank Whitechapel foundry London." No. 2 was cast out of two small bells in 1889, the only bells the church at that time possessed. Nos. 3, 4, 5, 6 were cast in 1892, and the treble bell in 1903. The old treble bell bore the inscription "Jonathan Larnces C W. W : K : B : F : ano 1718." The old second was an alphabet bell in black letter smalls. The Rev. Benjamin Bodycombe (small crucifix above the pulpit). A widower, he married his second wife in the Church. He suffered much ill-health and died after five years as Vicar, and he and his wife are buried in the Churchyard. He took a great interest in the music, and in young people. Mary Frances Urquhart. Her husband Major Charles James Urquhart built "Oswalds" (now Bincleaves) and after he died she lived at Spring Cottage. Florence Rose Mary Robson was daughter of the above and wife of Colonel Henry Denne Robson. They also lived at Oswalds. "She was the life and soul of the village," says one who knew her. John Beare, Lance-Corporal, R.E., who died, aged 25, as a prisoner-of-war in Japan in the Second World War. William Tucker of St. Andrews, another faithful churchwarden for many years in the time of the Rev. W. P. Schuster. He was a popular local farmer, and is buried in the Churchyard. Jack Stewart Newcombe, Pilot Officer, R.A.F., aged 21, and his brother Gordon Clifford Newcombe, Lieut., R.N., H.M.S. Glorious, aged 25. Both killed flying. Their mother and step-father, Major and Mrs. Campbell, lived at 8 Coastguard Cottages. They were "Two fine young men". Captain Frederick Godfrey Schreiber, R. N. (Retd. ), built the Lychgate in memory of his wife, Agnes Winifred, who died in 1949. It was dedicated by the Bishop of Salisbury in 1953 and is built of oak with a tiled roof. His own name is now inscribed there too. He died in 1966 after living at Stair House for 33 years. Capt Schreiber was a very generous benefactor, he donated £500 to the rebuilding of the Tower, with which work he was much involved. He gave £1,000 4% Consols to form "The Schreiber Trust" in 1954, which is primarily for the general upkeep of the Churchyard, particularly the Lychgate and the Schreiber grave and monument. The brass altar cross was another gift in memory of his wife. There are many interesting people buried in the Churchyard, villagers both well-known and lesser-known, who all played their part in shaping the life of West Lulworth. Rev, David Baldwin is now Team Rector in the Beaminster Area Team Ministry.